This is the third post in our series comparing the WordPress framework and the Wix platform. As with anything online, there are advantages and disadvantages to both. Before we begin our comparison between WordPress and Wix on this subject, you should understand that choosing a domain name for your site and deciding where it will be hosted are huge beginning decisions for your project. You want to choose a domain name that reflects your project and goal. Most people also want a .com extension for their site; so uniqueness can be hard to find. Your hosting service is important because it affects your security and site speed. And both your domain and hosting service directly affect your search engine optimization (SEO). Hosting & Domains – What are your choices and the cost? WordPress: You can create and register a domain name directly on the WordPress site but you’ll have to sign up for one of their monthly plans if you want a custom URL (name.com instead of name.wordpress.com). You can also transfer an existing domain name that was claimed through any number of domain services such as GoDaddy, NameCheap, etc. You might even find some cost savings by registering your domain outside of WordPress. Currently, NameCheap’s domain registrations start at $0.88 a year, but typically one could expect to spend about $10 a year for their domain name. As for hosting, it’s almost universally recommended that you go with a third party WordPress hosting provider – not because you can’t host via WordPress; but because you’ll find more powerful speeds and security through an outside provider whose sole service is hosting. WP Beginner has a great article on how to choose WordPress hosting with some examples. However, our top choice is missing from the list. We use Flywheel hosting exclusively. We love them for their speed and service – including their superior customer support. Hosting costs vary by provider and by your needs. How many visitors will you have per month? How much storage and bandwidth will you need? You can expect to spend anywhere from $20 to $75 per month. The current cost of the Wix Premium Store Plans. Wix: As with WordPress, you can either register your URL on the Wix platform or transfer an existing one. And again, you’ll have to subscribe to one of Wix’s premium monthly plans to get a custom URL without Wix in the name. 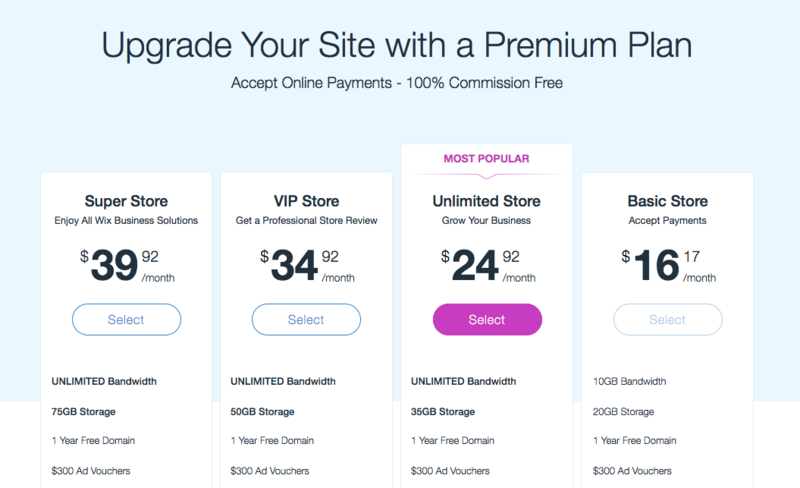 And if you plan on your site including an online store, you will also have to upgrade to one of their premium plans. Speed. We have mentioned that speed was an issue with Wix in a previous post in this series. As more and more people sign up for Wix, are they increasing their server size to accommodate more users and more need for bandwidth or are sites getting slower? Price. While we haven’t seen any evidence of this as of yet, if your option is the only option it’s easy to increase the price for your users, right? Wix does not support the exporting of files created using Wix to an external destination or host. All Wix creations are hosted on Wix’s servers. The advantages of using Wix as your host include improvements to your site’s loading time, search engine optimization and more. So where should you host your domain? How We Can Help: We’ve demonstrated that where you purchase your domain isn’t that important. But contact us to help you come up with your custom URL that accurately relays your company’s unique message. As for hosting, we can add you to our professional hosting group via Flywheel where you will enjoy worry-free maintenance, the utmost security and regular site backups. Overall Recommendation: If we were basing our WordPress vs. Wix decision solely on hosting options and cost, we would encourage you to go with WordPress at this time. Our next WordPress vs. Wix blog post will focus on overall design. and/or contact us using the form below!